Rotary Club of Warri, District 9141 in collaboration with Leadership Initiative for Transformation and Empowerments, LITE-Africa, have trained 46 Officers and Men of Nigerian Police, Navy, Air Force as well as Nigerian Security and Civil Defence Corps, NSCDC on Voluntary Principles on Security and Human Rights, VPSHR, with a view to enhancing their professionalism and ensuring peace in the forthcoming elections. The two days training which held in Warri, Delta State, from February 8 through 9, saw participants undergoing intensive interactive sessions on the impacts and implication of globalization on the populace, growing International interest in relationship between business and human rights as well as the need for the security personnel to become disciples in propagating and protecting human rights in the course of their duty. District Governor of District 9141 of Rotary International, Rotarian Adeyemi Oladokun who addressed the participants at the end of the training, stressed that Rotarians are optimistic that peace is achievable and opined that without the security agencies, there will be no peace. DG Oladokun described the training of the security officials by Rotary Club of Warri as a star project, saying security agents cannot be paid for the risk they take in protecting lives and properties. President of Rotary Club of Warri, Rotarian Happy Apai, explained that February is the month of peace and conflict resolution for Rotary Club, hence the need to organize the training for the security personnel, particularly against the backdrop of the forthcoming polls. Rotarian Apai noted that sanitation, community development, disease prevention, educational advancement as well as peace and conflict resolution are among the six areas Rotary Club of Warri is focusing in the 2019 Rotary year. 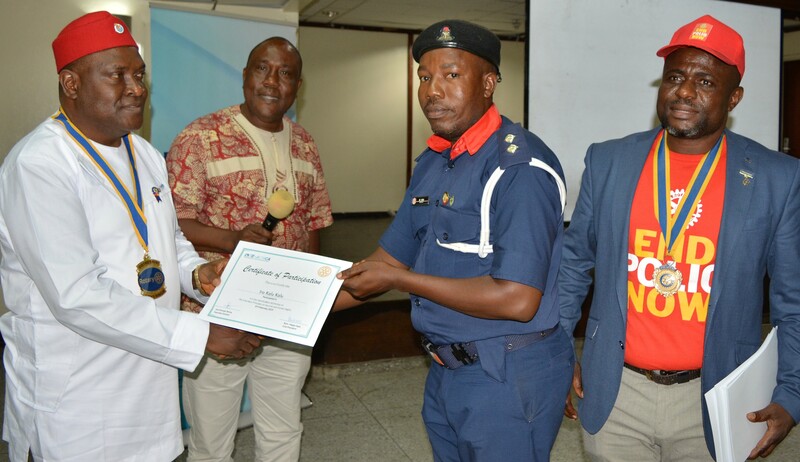 Highlights of the training were the sharing of knowledge gained by a representative each from the Police, NSCDC, Navy and Air Force as well as the presentation of certificates to the participants.